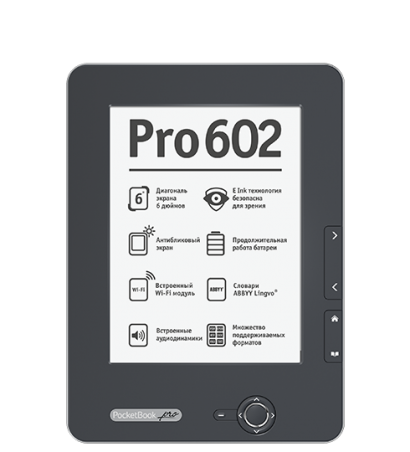 Electronic (E-Ink) technology makes reading with PocketBook Pro 602 much like reading an ink on paper book. The screen supports 16 shades of gray in reflecting light to display texts and illustrations. E-Ink technology decreases the potential for eye strain as it provides more stable, lasting images than flickering TFT conventional displays. Read for hours in comfort. PocketBook Pro 602 offers a wide viewing angle and can be used in direct sunlight. As a set-up option, refresh without darkening the screen. A single battery charge provides PocketBook Pro 602 with enough power to read 20 standard books, about 14,000 page turns, or a month of two-hour daily reading. Go online using PocketBook Pro 602. It will connect to the Web anywhere Wi-Fi is available. Its full-scale browser will display all Internet pages suitable for E-Ink screens. Your PocketBook e-reader features customized Adobe software to support e-books with DRM (EPUB and PDF files with copyright protection). PocketBook Pro 602 has a built-in MP3 player. Listen to an audio-book or read while listening to your favorite music. One of the most prominent features of PocketBook Pro 602 is support of maximum possible text formats: FB2, TXT, PDF, DJVU, RTF, HTML, Docx, PRC, CHM, DOC, TCR, FB2.ZIP and EPUB, including DRM, plus image formats JPEG, BMP, GIF. You won’t have to search for one specific format or convert your files to it – our PocketBook read them all. All you need to do is to download your book or song then copy/paste your files to the device. What can be easier than that? If you use your device not only as reader but as a music player or data storage, you’d be willing to increase the memory of your device for your additional comfort. This PB model supports SD memory cards with up to 32 Gb capacity. Note that reading and wriging on and form the card would not impact the reader’s performance at all. It is very easy to upgrade your firmware with PocketBook Pro 602. All you need to do is download the firmware upgrade file form one of our website, unzip it (if it is in archive), copy it to the root of your Memory SD card and read the steps to install it in the installation manual that would be in the same archive. Transferring data to and from the device is more than simple – connecting to your PC would be enough to copy/paste books or music files to the appropriate folder. 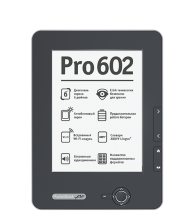 User Manual gives more detailed description how to transfer data with PocketBook Pro 602.